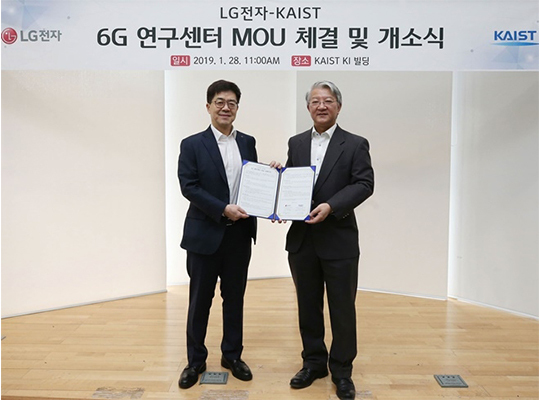 South Korea’s LG Electronics said Monday that it has opened a 6G research lab at KAIST INSTITUTE (KI) under state-run Korea Advanced Institute of Science & Technology (KAIST) to prepare ahead for the technology beyond 5G whose commercial engagement is in fledgling stage. The opening ceremony was attended by Park Il-pyung, chief technology officer of LG Electronics, Kim Byung-hoon, head of next-generation standard research of LG Electronics, Park Hee-kyung, vice president for KAIST’s R&DB and Lee Sang-yup, head of KI. KI founded in 2006 has focused on a cross-disciplinary approach in projects to develop new technologies to drive the Korean economy. LG Electronics aims to take a leadership in future 6G enabling technology based on close industry-academia collaboration with KI researchers and resources. “It is significant to start the development of proprietary 6G mobile communication technology ahead of others and prepare for the next decade,” said Cho Dong-ho, a KAIST electrical engineering professor who will head LG`s 6G research lab. “With the establishment of the 6G research center, we will strengthen the research of next-generation mobile communication technology to lead global standardization and grab an opportunity to create new businesses,” said LG`s chief technology officer Park Il-pyung.